Who knew, right? I mean, I knew. The film was my go-to for campy popcorn fun back in the day along with the likes of THE GOONIES and HOUSE (and HOUSE II) whenever I wanted a little something spooky, death-defying, mysterious, and just a whole lot of kid fun. It was the age of the kid horror film, which as you know has seen a whole lot of resurgence since Netflix hit gold with STRANGER THINGS and IT suddenly coming back with a vengeance. Don't get me wrong: the film truly bombed back in the day. Its budget was only $12MM, and yet it only managed to rake in a paltry $3.8MM in the U.S. box office, which by today's numbers is next to ungodly failure, the kind of downfall that would murderously close the doors of any production studio and bury it in a pile of werewolf poop. ....Than the kid who led the Monster Squad himself: Andre Gower (pictured above on the right with Ashley Bank (Phoebe) and the director Fred Dekker), otherwise known as Sean (granted not as cool a name as "Mikey" or "Sloth" or "Chunk" or anything like that!). The documentary is entitled WOLFMAN'S GOT NARDS: A DOCUMENTARY, released just this past April, 2018 (right under my nose, in fact). Interesting title, but it makes perfect sense: that title was arguably the best line in the entire movie when "Fat Kid" Horace punted the Wolfman right in the "nards" during the coolest action scene you'd ever see in a kid horror film. No joke. 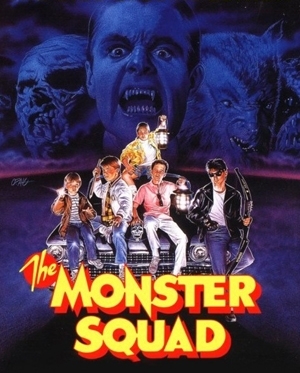 It just so happens that this idea happens to be about how THE MONSTER SQUAD influenced an age of movie-goers for literally 30 years in the making. The same could be said for THE GOONIES, and THE GATE, and TROLL, and other classic campy films like MATINEE. But if and when you do get the chance to check out this documentary on a classic horror film for kids (and make no mistake, this is a horror film -- for kids, which THE GOONIES most likely is NOT a horror film at all), be praised.